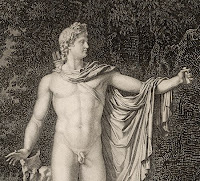 The number of images of the Apollo Belvedere make it an interesting image to use to compare the works of different artists. 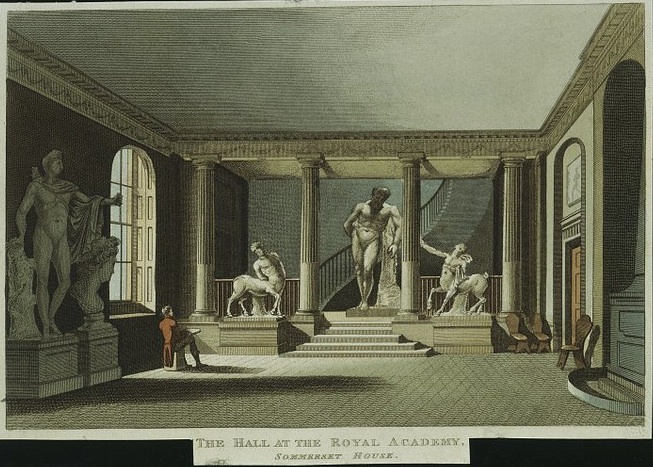 Engraving of the interior of the Radcliffe Library about 1840. 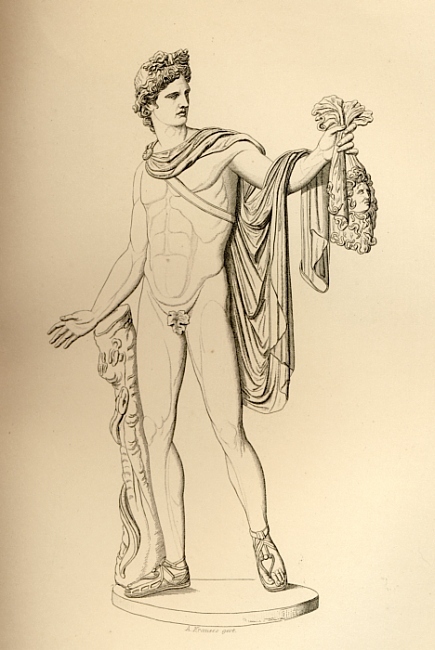 Casts of the Apollo Belvedere were abundant in public places and schools in the 19th century. Bryn Mawr College has a copy of Hendrick Goltzius' print of The Apollo Belvedere. 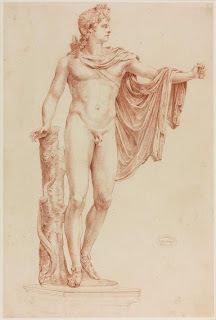 Another print by a different artist, Marcantonio Raimondi, at the Metropolitan Museum. 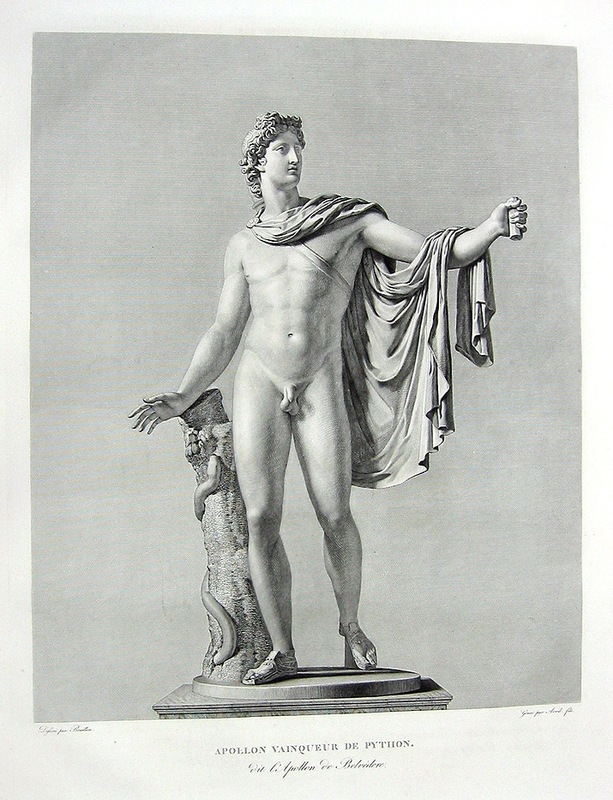 Albrecht Durer's Apollo was influenced by the Apollo Belvedere. 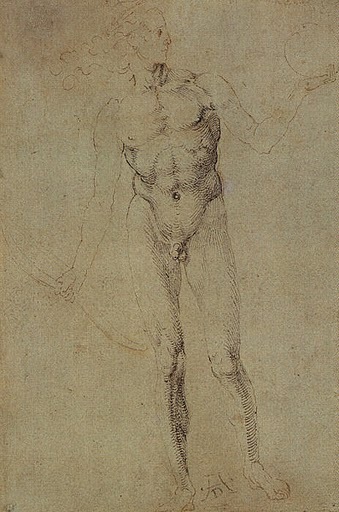 Human Figure drawings by Albrecht Durer. 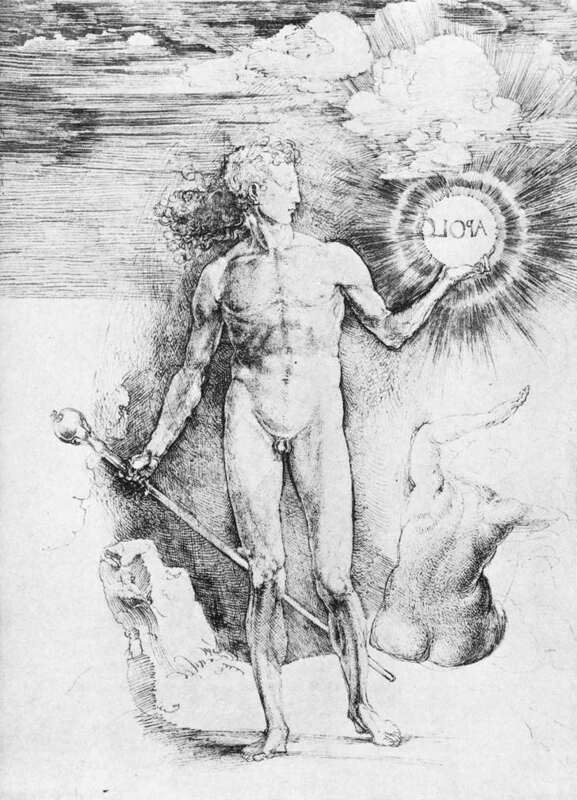 De Symmetria Partium in Rectis Formis Humanorum Corporum / Underweysung der Messung (Multilingual Edition) This is also by Albrecht Durer. 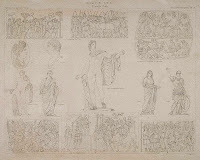 The title roughly translates as "On the symmetry of objects and how parts resemble each other when viewed at right angles"
that the idea of a woman sculpting a male figure was seen as threatening, and publishes this cartoon of a Damien Apollo to prove it. 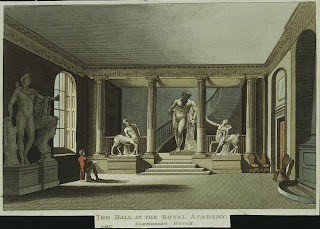 William Hogarth includes the Apollo Belvedere in his print The Analysis of Beauty. 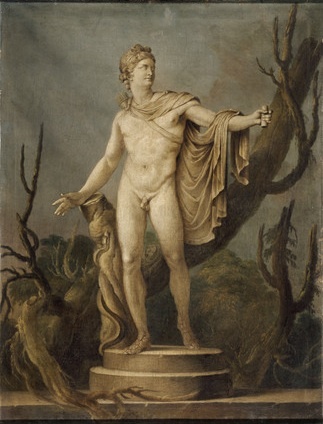 An image with a fig leaf. 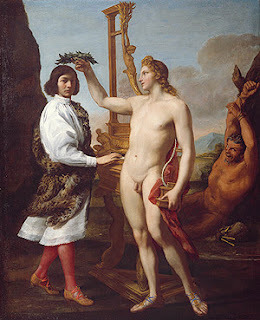 Another image with a fig leaf. 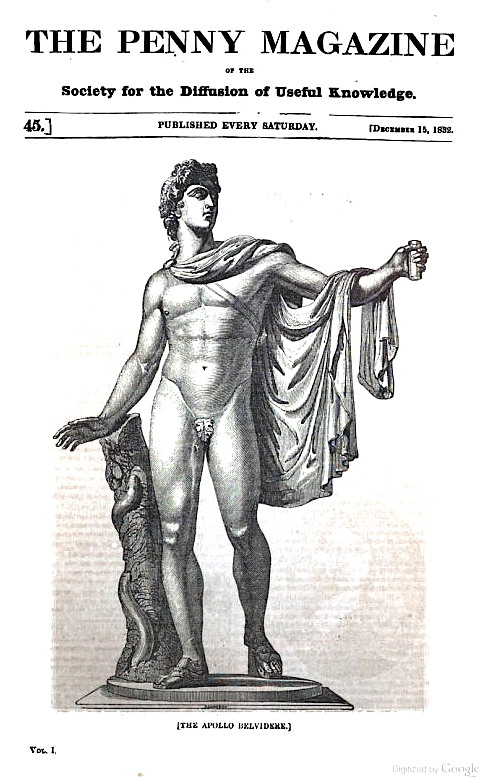 Apollon Vainquer de Python - Drawn by Bouillon, Engraved by Avril Fils. 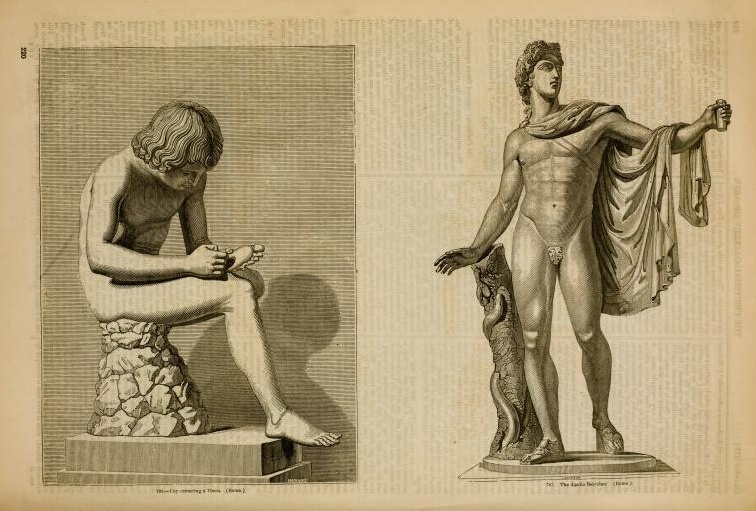 See another post with more pictures from this book: Classical Sculptures from the Musée Francais. Covers of the December 1832 edition of The Penny Magazine. The first is a photograph of the cover which is for sale on Ebay Click here to see it on Ebay, the second is a scan from Google Books. THE APOLLO BELVIDERE. 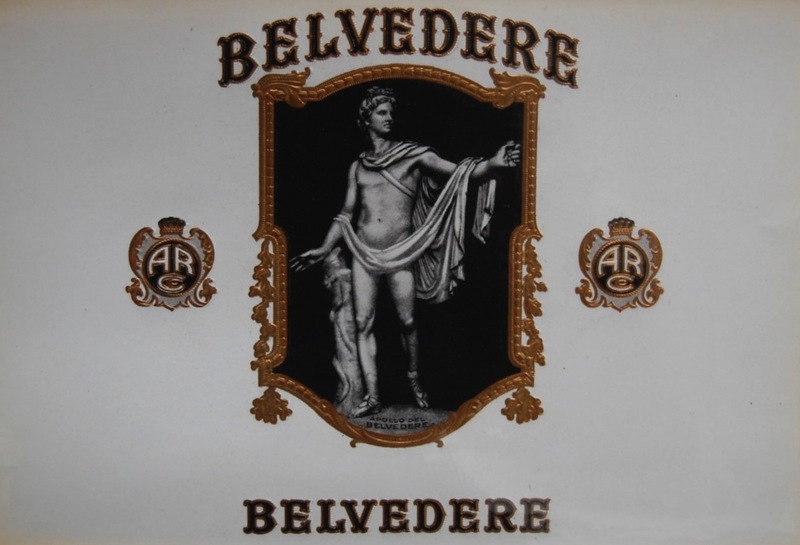 The names of few works of art are so familiar to our eyes as those of the Apollo Belvidere and the Venus de Medici; the first one of the innumerable wonders of Rome, the second one of the ornaments of Florence. 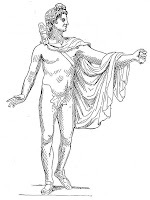 The Apollo Was found at Antium, now Anzio, which was the birth-place ot Nero, and one of his favourite places of residence. 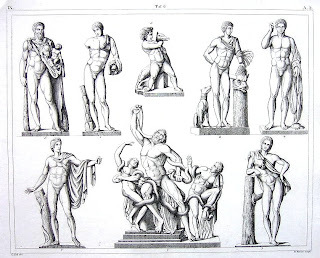 As in the case of the Laocoon, this statue was for some time supposed to be a work belonging to what we are accustomed to call the best age of Greek sculpture, by which, as we have already explained, we generally understand the period of Phidias and that immediately following it. 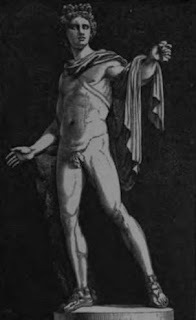 Indeed the Apollo is now sometimes called the work of Phidias, just as if there were some good reason for giving it that name. And here it may be well to put our readers on their guard against giving credit to the loose assertions of most writers as to matters of antiquity: very few have either time, inclination, or sufficient knowledge to investigate them completely. 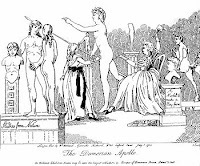 When then an assertion is made, such as, " that the Apollo Belvidere is the work of Phidias," it is quite fair to ask for the proof; and perhaps this will apply equally well to other assertions about things of more importance than the paternity of a statue. Some French critics first observed the fact of the Apollo being made of Carrara marble, which Pliny speaks of as being newly worked in his time, under the name of marble of Luna. 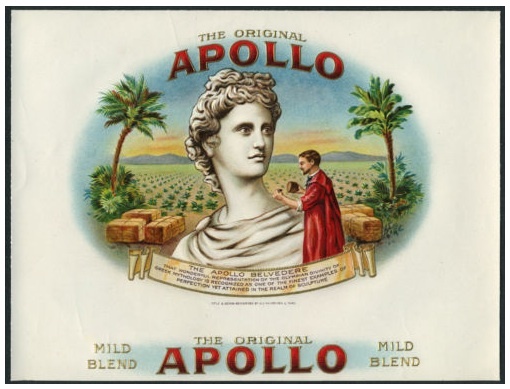 If this is undisputed, we cannot assign the Apollo. 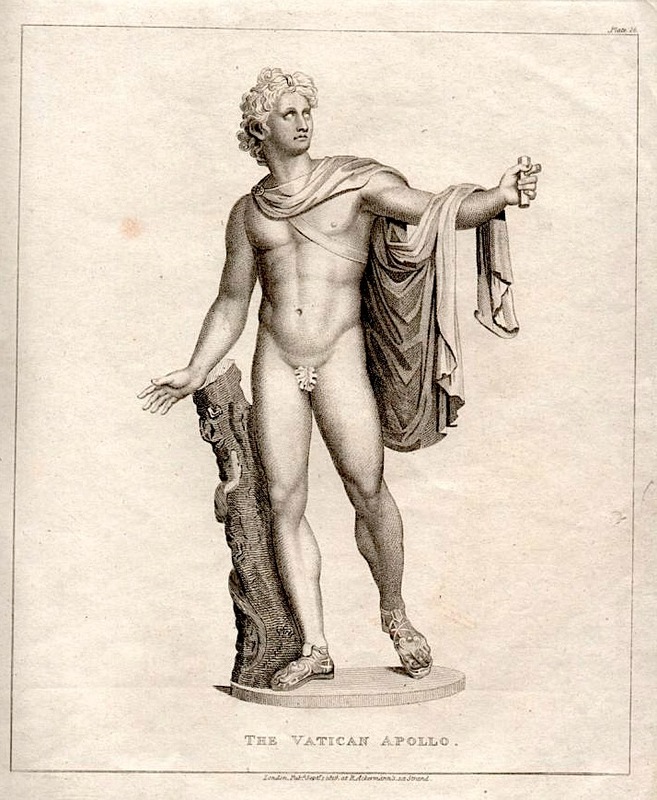 to any other epoch but that of the early Roman emperors, and it seems the most probable hypothesis that it was made for Nero to adorn his sea villa at Antium. 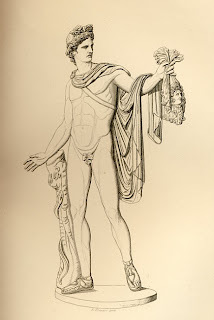 This man, whom history has represented to us as a cruel tyrant, an unnatural son, and the murderer of his wife, was still a lover of the arts, and perhaps no mean judge of them, as far as we can discern through that cloud of abuse in which the history of the early emperors is enveloped. 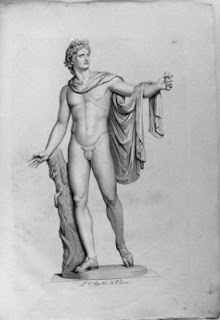 The noble figure of'the Apollo, perhaps one of the last efforts of Grecian art to perfect the ideal form of the Archer god, stood at Nero's bidding in all its beauty before the master of the Roman world. And can we doubt that he felt and admired that perfection which never yet was embodied in a living form ? To attempt to express by words the impressions which are produced by the highest productions of nature or art, is a vain attempt: with those who do not feel, it results in mere words that have no definite meaning; with those who do, it can only result in a complete conviction of the inability of words to express the images of thought. 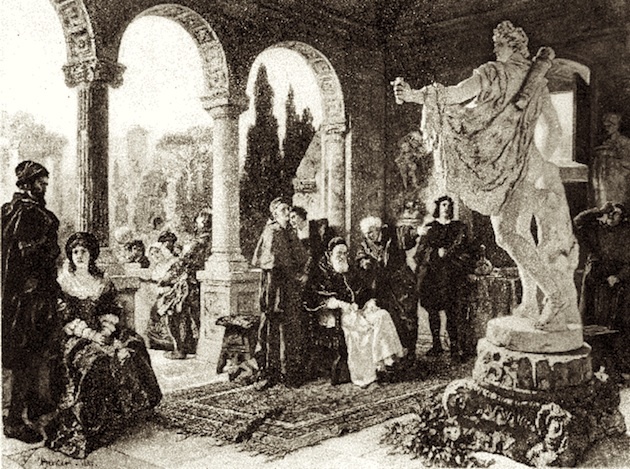 No such difficulty would be felt In treating of the Venus de' Medici, a statue which is beautiful, and, for what we know, faultless in execution, but as far removed from the ideal form of the goddess of Love, as the most ordinary female figure that we meet with. 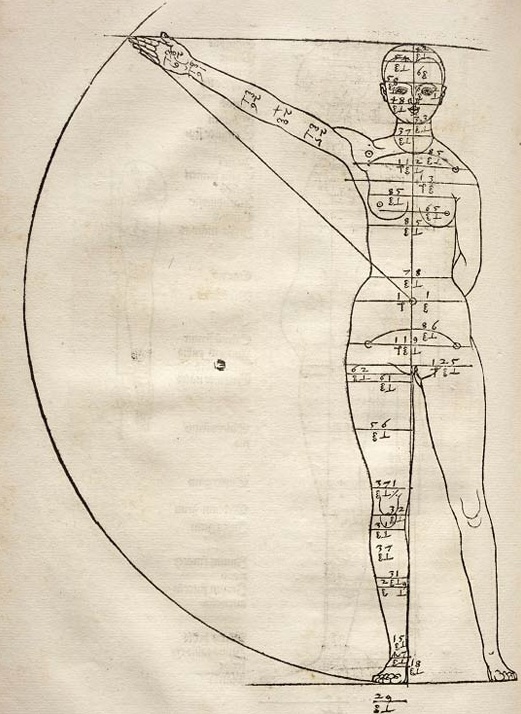 Johann Gerog Heck, Iconographic Encyclopaedia of Science, Literature, and Art, Tafeln 6. Top Row Left to Right: 5. 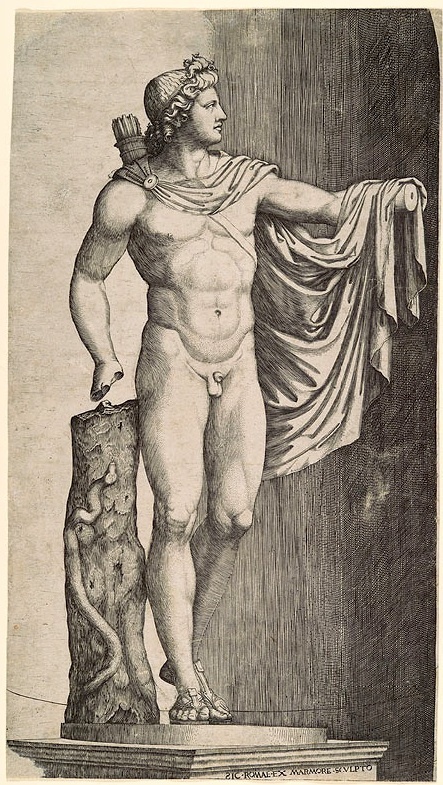 Hercules with the boy Telephus on his arm, in Rome, 1. 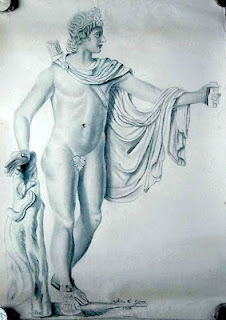 Statue of Antinous of Belvedere, 6. Boy wrestling with a goose, 8. Statue of Meleager, in Rome, 4. 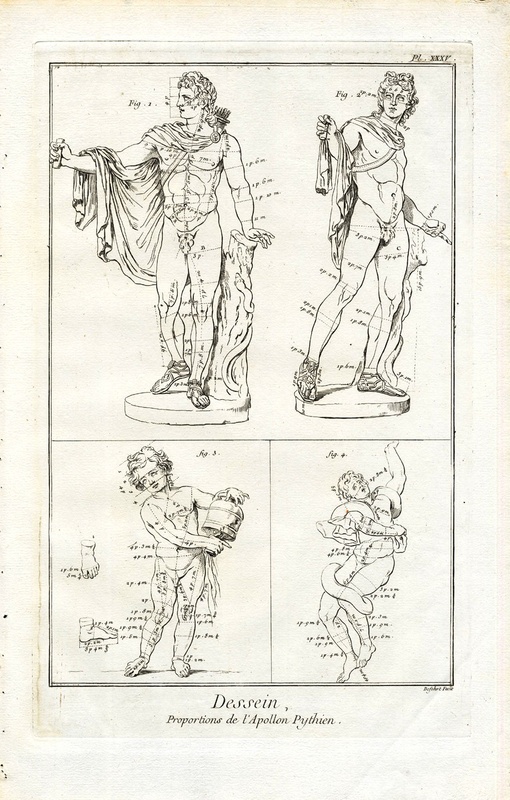 Statue of Germanicus, from the 15th century; it belongs to the period of the revival of art, but the sculptor is not known.Bottom Row Left to Right: 2. 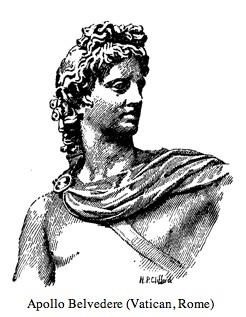 The Apollo of Belvedere, 7. Laocoon, in the Vatican, 3. 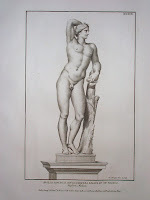 Statue of a Faun. Weird race history chart showing the Apollo at the top of the chain. From the post at Contexts.org. 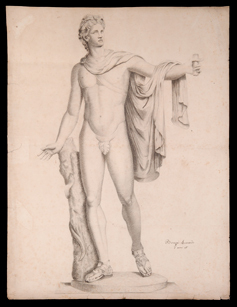 Another evolutionary drawing from a frog to Apollo by Johann Kaspar Lavater, from the web site Griechische Philosophen über die Evolution der Arten. Proportions of Apollo from the same site, the page Apollo Belvedere. Check out my other posts on Physiognomy. Sculpture by Antico Italian School, 15th Century. From the painting by Carl Becker. From Romance of Roman Villas, by Elizabeth W. (Elizbeth Williams) Champney. Copies of Ancient statues in St. Petersburg, Russia. 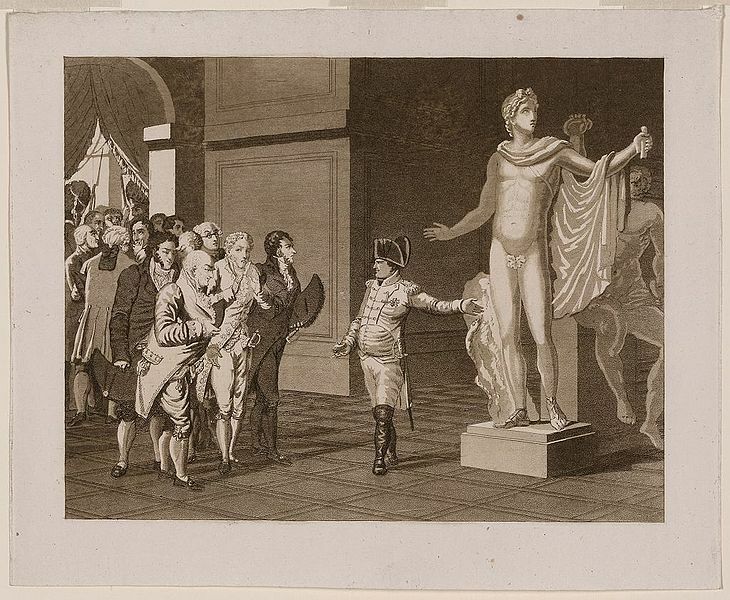 Goethe in Rome, with images of the Apollo Belvedere. A different Apollo, another plate from Raccolta di Statue Antiche e Moderne by Roman publisher Domenico de Rossi, Apollo Ignudo. 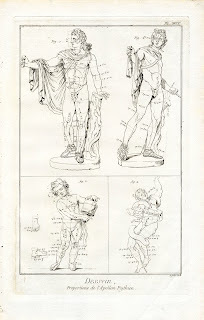 Una galleria delle fonti testuali e figurative. 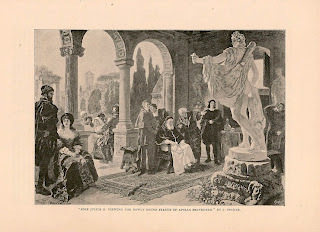 Carl Becker painted a painting of Pope Julius II viewing the newly found Apollo Belvedere, the image appeared as the frontispiece of The Romance of Roman Villas by Elizabeth W. Champney, from project Gutenberg. A better image of the painting reproduced in The Cosmopolitan Magazine from 1892. 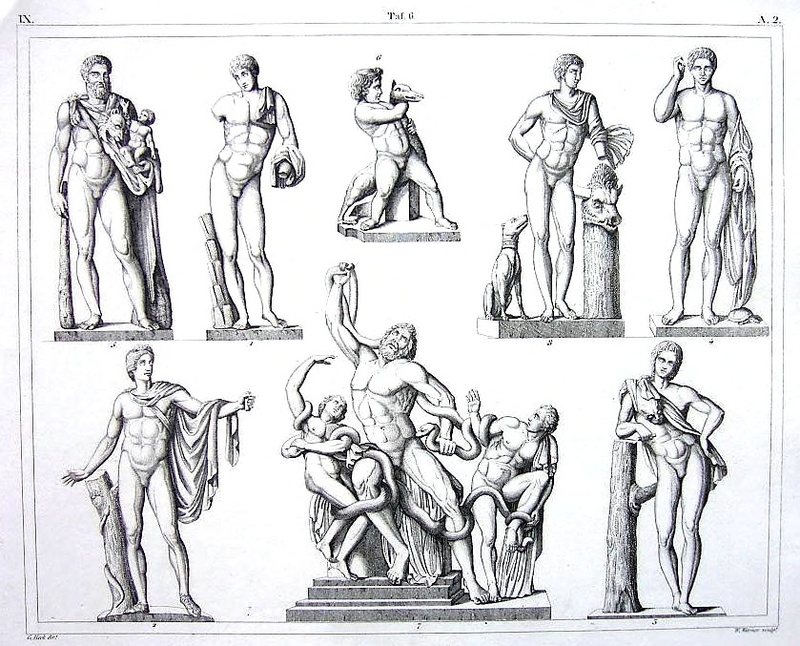 Engraving from the New Gresham Encyclopedia . Link. A print by Marcantonio Raimond i from the Met Museum. 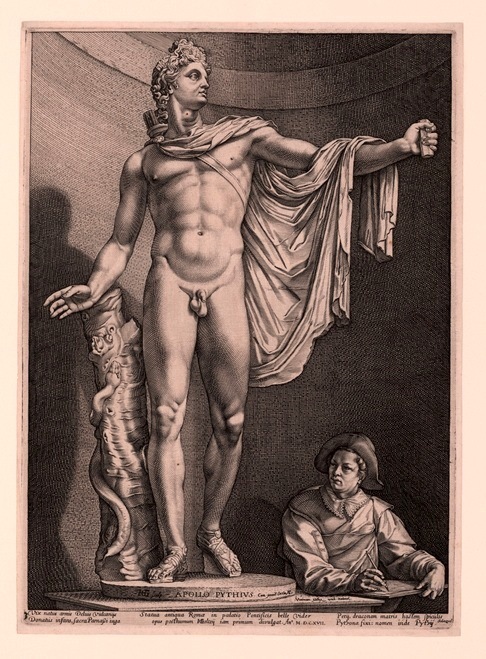 Raphael, Dürer, and Marcantonio Raimondi: Copying and the Italian Renaissance Print . 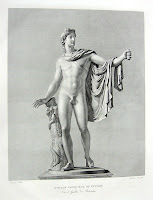 The Vatican Apollo from R. Ackerman's book. 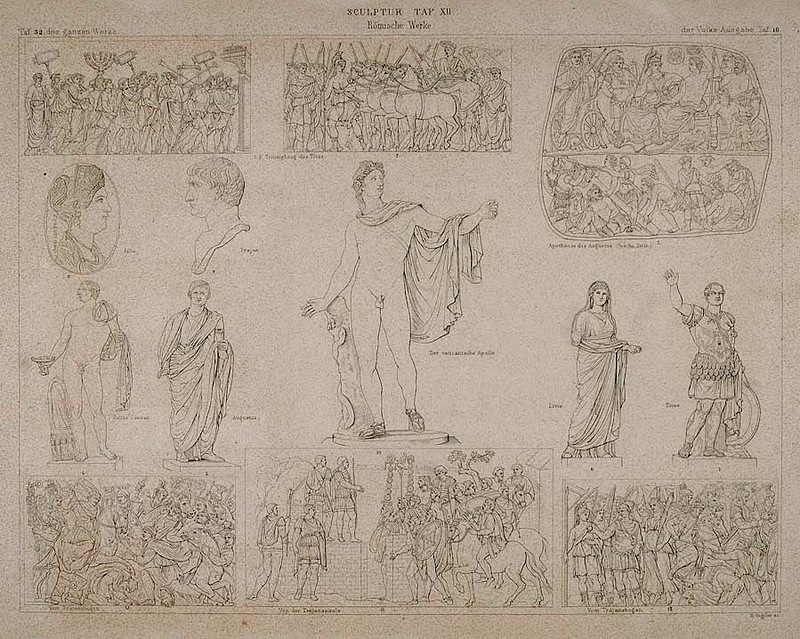 A print from 1870 showing the Apollo Belvedere in the center and Triumph of the Emperor Titus; Apotheosis of Augustus; Julius Caesar; Augustus; Livia; Titus; Julia; Trajanus; Relief on the Column of Trajanus; Relief from the Arches of Trajanus. 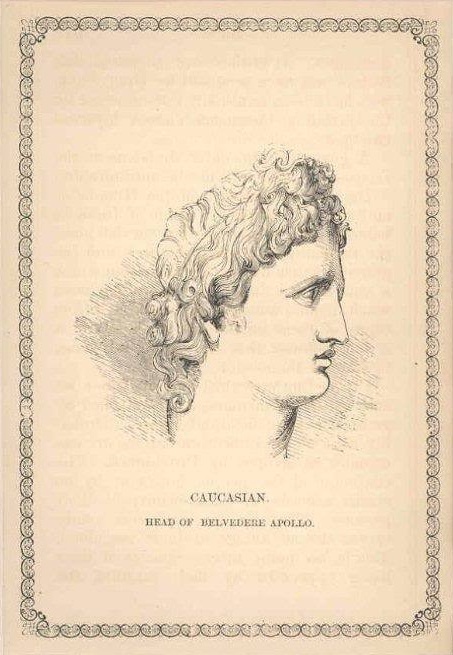 Print of the head of the Apollo Belvedere used as an example of the caucasian race. 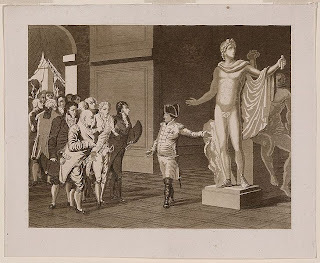 Napoleon and the Apollo Belvedere from the University of North Florida. Apollo Belvedere in a landscape. 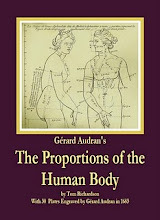 Another example of proportions from the Encyclopedia is in this post. And another on here.